The monument in South Dakota was designed to inspire awe at the greatness of American democracy, said journalist Sam Anderson. Today, there’s something poignant about the sculpture’s self-confident grandiosity. NOTHING ABOUT OUR trip to Mount Rushmore went according to plan. Our flight was delayed. We found ourselves stranded in the Minneapolis airport for four hours. “Minneapolis airport four hours,” we typed into Google, and the internet responded by persuading us to take a train to the Mall of America. It was not just a mall but an elaborate fun house of malls, at the center of which was, somehow, a gigantic amusement park. I could see my kids’ minds recalibrating the relative scales and possibilities of American experience. They wanted to stay forever, to be swallowed by the crowds, but we were on a different pilgrimage, in search of a different America, so we continued on. Late that night, finally, we reached South Dakota. It was unfathomably empty. In downtown Rapid City, we idled at empty intersections, block after snowy block, waiting for traffic lights that governed no traffic. Emptiness is, to some degree, South Dakota’s natural condition: It is the 17th-largest state in the country but has only the 46th-largest population—the square mileage of Senegal, the people of Fort Worth. Why were we there? Why had I dragged my family—my wife and our Snapchatting 12-year-old daughter and our long-haired, talkative 9-year-old son—away from work and school to see, of all places, Mount Rushmore? I couldn’t say, exactly. All I knew was that I seemed to be suffering a crisis of scale. America was taking up a larger part of my mind than it ever had before. It was dominating my internal landscape, crowding out other thoughts, blocking my view of regular life. I couldn’t tell if it was reaching its proper size, growing the way a problem tends to grow just before a solution is found, or if it was swelling the way an organ does before it fails and bursts. I felt drawn to Mount Rushmore, instinctively, like a spawning fish to the head of a river. I wanted to look American bigness squarely in the face. THE BLACK HILLS are a geological oddity—an island of rock thrusting out from an ocean of prairie. They contain some of the oldest and hardest stone in the world; over the course of 70 million years or so, erosion has sculpted them into spindly towers and ragged loaves, 5,000-foot-high turrets protected by moats and moonscape boulders. To the Plains Indians, the area was supernaturally charged, a place of powerful spirits, sudden raging storms, magic caves, and special trees. The landscape was so rugged and remote that it managed to repel white civilization deep into the 19th century. This changed suddenly in the 1870s, when the notorious George Armstrong Custer arrived to make a map of the Black Hills. In the course of exploring, Custer’s men discovered gold. Word flew across the nation, and before long a fire hose of white Americans went spraying into the isolated land, violating an Indian treaty with impunity, setting up mining towns and trading posts, blasting roads through mountains, changing the nature of the place forever. Before long, of course, the boom went bust. Many miners left; the region’s economy sagged. In the 1920s, local boosters proposed an eccentric solution. 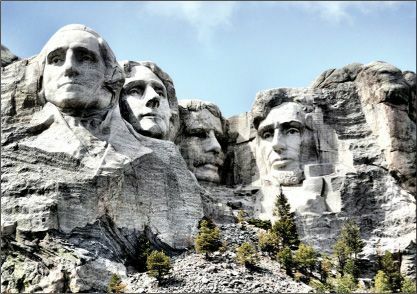 What if some of the Black Hills’ ancient rock could be carved into a monument to American history—a patriotic tribute that would also serve, in this new era of automobiles, as a roadside attraction? Only one American sculptor seemed up to the task. He was, like the sculpture he would create, a larger-than-life weirdo: John Gutzon de la Mothe Borglum, son of a Danish immigrant, friend of Auguste Rodin, publicity hound, populist, salesman, self-styled tough guy with a white Stetson and a flowing scarf and a dark, bushy mustache. At the time, Borglum was working on another huge sculpture chiseled into the front of a mountain: a tribute, in Georgia, to great heroes of the Confederacy—Jefferson Davis, Robert E. Lee, Stonewall Jackson. Funding for Mount Rushmore was touchand- go, as was political and public support. But Borglum would not give up. The project took far longer, and cost far more money, than anyone could have imagined. Logistics were murderously complex. Men were lowered over the rock face on sling chairs; carving was done mainly with dynamite and jackhammers. At one point, a crack running through the stone threatened to break Thomas Jefferson’s nose, so his face was blown off the mountain and started again in a different spot. Mount Rushmore is not just big; it is about bigness—a monument to monumentalism. Borglum was obsessed with America’s size: the heroic story of a handful of tiny East Coast settlements growing to engulf an entire continent. The four presidents were chosen largely for their roles in this expansion. Jefferson, for instance, not only wrote the Declaration of Independence but also greatly increased the country via the Louisiana Purchase. Teddy Roosevelt oversaw the creation of the Panama Canal, which increased America’s global reach. The sculpting of Mount Rushmore began in 1927, with a ceremony overseen by President Calvin Coolidge, who wore a comically large hat. Work spanned 14 years, encompassing some of the defining spasms of American history: the Great Depression, the beginning of World War II. The sculpture was finished one month and one week before the attack on Pearl Harbor. Work would have continued—the plan was to depict each of the presidents down to the waist—but funding began to dry up again, and Borglum died, and after a few finishing touches, the figures were abandoned as good enough. This was precisely the moment when American influence was about to explode, the dawn of 50 years of prosperity and cultural dominance. Mount Rushmore was completed, conveniently, just in time to serve as a kind of superheated mascot for the mythology of the Greatest Generation and the Baby Boomers: that America’s hugeness is bound up with its nobility, that it deservedly dominates the globe. SEVERAL TIMES, AS we drove to Mount Rushmore, we worried that the road was too small for our car. We had rented a huge SUV, like a tank without the gun turret—a rolling monolith of American power—and the road to Rushmore was old, narrow, and winding. The pavement was covered with a skin of snow; we chugged over it with confidence. In this way, winding and winding, switchback after switchback, we made our way up the mountain. By the time we pulled into the Mount Rushmore parking garage, after an eternity of winding, everyone was exhausted and starving. The park’s restaurant was closed for renovation, so we settled into a sort of triage-unit café next door. We ate the bad food in tense silence. After lunch we walked outside to the viewing deck, and there, well, there was Mount Rushmore. That was really the biggest thing you could say about it: There it was. Rushmore is a ubiquitous American image, tattooed on the inside of every citizen’s eyelids, so it felt disorienting to see it in three-dimensional space, pinned to this particular spot on the earth. We had the viewing deck almost to ourselves. There was Washington, out front, the leader of the band—noble, aristocratic, and smooth, his mouth a grim stone line. A dollop of snow stuck to the bridge of his nose. Peering over his shoulder, like a shy sidekick, was Jefferson, his big nose held high, showing his nostrils to the world. (This was not an artistic choice; the grain of the rock had forced Borglum to tilt the head back.) Lincoln stood apart from them, heavy eyebrows frosted with snow, and in the middle, almost swallowed by the mountain, was Teddy Roosevelt, with his wire-rimmed spectacles and Freddie Mercury mustache. They were all looking in slightly different directions, not at us but far over our heads, into the great American distance. I must admit that, in person, I was not especially moved by the beauty of the sculptures. They were, essentially, traditional busts, distinguished mainly by their insane scale and placement. The novelty of it was stronger than the beauty. What stood out most was everything around the presidents’ faces: the Black Hills landscape that spreads and spreads, incorporating eons of old rock and new growth. This was something that was hard to appreciate in photographs, which tend to be tightly cropped—just the presidents, stony and smooth. But the mountain itself is magnificent: rough and rutted and craggy, like an ancient crocodile’s back. It made the giant heads look small. I felt a rush of emotion that was not patriotism but awe: awe at human weirdness, at our capacity to create, in the actual world, such an improbable and unnecessary artifact as this. Why had humans done this? Why did Mount Rushmore exist? “Oh, it’s a nice little mountain thing,” my son said appreciatively, and then he asked if we could leave. We drove away from Mount Rushmore, down and down, through the uncarved wilderness, into the city of Custer, a windswept Old West outpost. 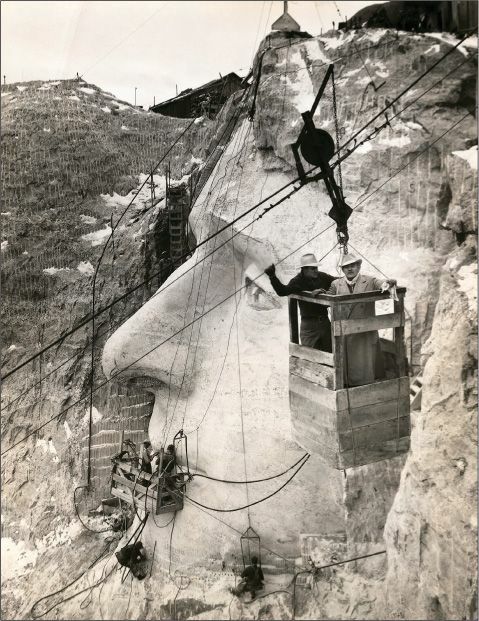 Outside Custer was another granite mountain being carved, Rushmore-style, into the enormous likeness of a historic figure. It depicted Crazy Horse, the enigmatic leader of the Oglala Sioux, one of the fiercest defenders of the Black Hills from the indignity of white invasion. It was a sort of corrective to Rushmore, a reclaiming of the landscape by the people from whom it was stolen. My family was tired and refused to get out of the car, so I walked through the museum myself. The carving has been in progress, without federal funding, for nearly 70 years. The finished figure will be 563 feet tall, sitting on his horse, pointing toward the Black Hills. And it began to seem foreign to me, our American obsession with size. We are born a fantasy of bigness. We are tall and strapping, with big hats and big hair and loud clothes and booming voices. We drive our big cars through the epic landscapes of our giant continent. We work in tall buildings, where we give 110 percent in order to build larger-than-life careers. Our great ideas define infinite eras. Our big weapons win big wars. We are economically, geographically, culturally, and spiritually huge: the Gigantic States of America. There is something childish about this fantasy—the way it tends to conflate virtue and size. Why does goodness have to be huge? It is a dangerous belief, and one that inevitably causes stress and confusion when—as it must—it runs up against reality. Inevitably, there will be a shift in scale; the dominant thing (nation, culture, religion, demographic) will begin to shrink. Does it lose its virtue with its dominance? If we truly believe that, then what virtue will we not be willing to sacrifice to make ourselves feel big again? Later, as the sun was beginning to set, we drove through Custer State Park. We passed through huge, shaggy herds of buffalo, which raised their heads and stared. The landscape seemed to change every 500 feet: lakes, buttes, forests, gashes of red dirt. A small herd of pronghorns glided over a bluff, ghostly white on the snow. It was as beautiful as any land I’ve ever seen; driving through it inspired the kind of awe that the sculptures of Rushmore had not. But then again, we never would have seen this landscape if we hadn’t come to look at Rushmore.